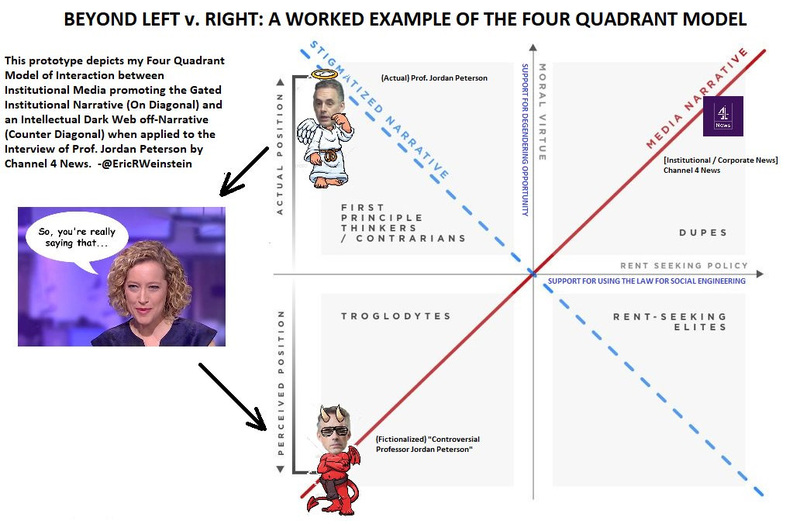 I found the “Four Quadrant Model” developed by Eric Weinstein an interesting take on the current state of thinking. After the Cathy Newman interview with Jordan Peterson, Weinstein applied his model to describe the phenomenon of how the mainstream narrative interacts with the counter-narrative, or stated alternatively: group-think versus independent thought. 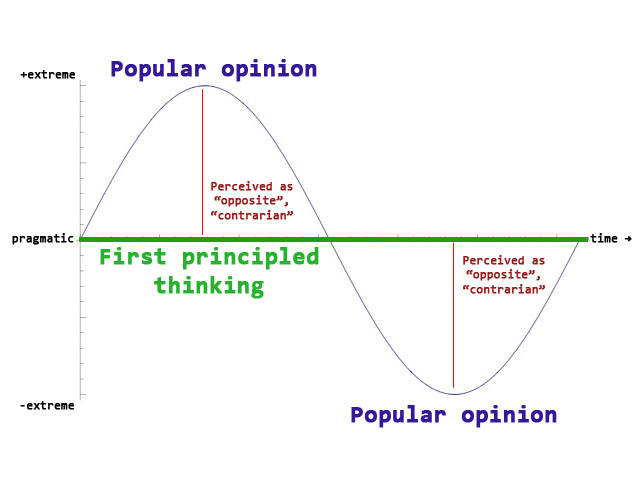 Something that caught my attention in the above graphic was the inference that first principle thinkers are “contrarians”. Now why is that? As I have stated many times before, thinking from first principles can be done independently. You can arrive at the same conclusions using correct and consistent logic as other first-principled thinkers without ever having interacted with the other thinkers. The conclusions are unaffected by their opinions. First principled thinking is a constant. The propagation of a grand narrative is driven by group-think. Conclusions are heavily influenced by the status quo. They vary over time, shaped by opinions normally of those from a perceived authoritative position, or by popularity. Group-thinking is a variable. Hence on any given issue, the status quo changes over time, but the pragmatic stance is constant. In other words, you can always arrive at a well-reasoned conclusion applying first-principles, even though the environment and issues being addressed may be different as time progresses. The grand narrative, however, tends to take a variable stance and cycles between the extremes, overriding constructive criticism using the fashionable argument ad populum for a point in time. It follows that rational thinking will always appear to be on the “opposite” side of mainstream thinking, even though in reality it is not representative of an extreme, but rather somewhere in the middle as a consequence of recognizing nuance. It is frequently considered contrarian because its conclusions are not driven by a majority, which leads to its conclusions rarely siding with the majority. Conclusions are instead driven by replicability of independent thought. It is human nature for these cycles of group-think to exist. Humans are fallible and you can’t fix human psychology. Everyone is susceptible to bias and taking mental shortcuts. However, some are more capable and willing to think critically and independently more than others. Psychology and probability dictate that first-principled thinking will almost always be considered contrarian. It shows in the model — the sine wave and the straight line in the graph overlap an infinitesimal amount of instances over time.